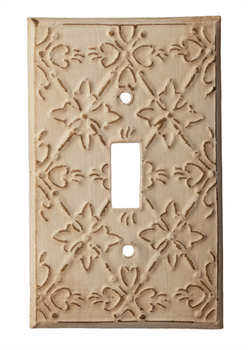 Our beautiful selection of handmade decorative switch plates are made in Vietnam from recycled brass. 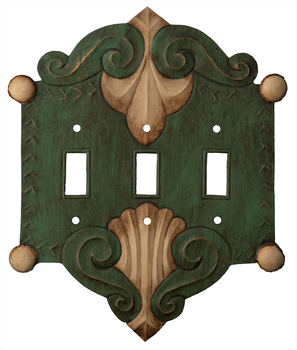 They are then either oxidized to a darker finish, or painted with a shabby chic look. Because they are hand finished, some variation will occur between plates. To search for a particular configuration, go to the search window and enter the beginning of the configuration code. For example: single toggle is T1, double toggle is T2, etc. For the decora or rocker configuration, the code is R1, or R2, etc. The outlets are L2 for the standard outlets or L4 for a double outlet. In several designs, we offer up to 6 toggles or rockers. We also have phone (P1) and cable (B1) covers in several designs. Or choose a design and see in which configurations it is available.